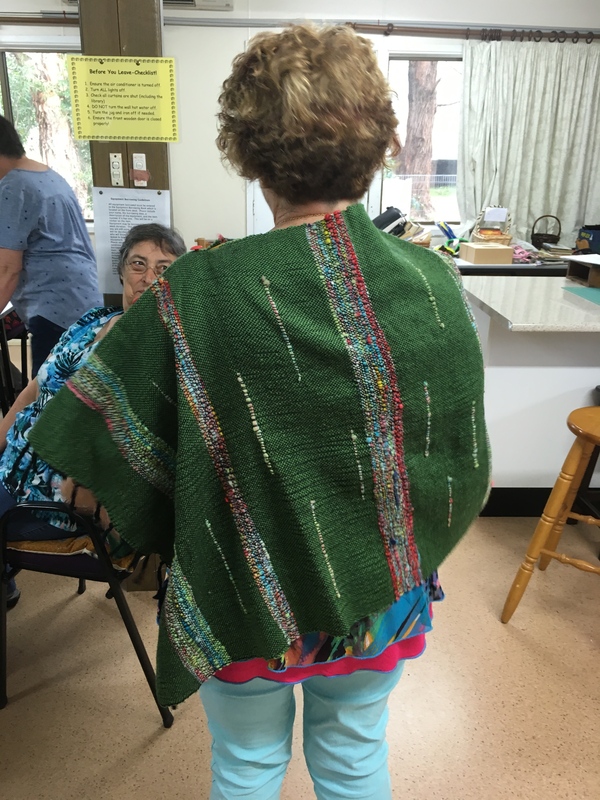 On Wednesday 22nd March, Lyn and Julie went to visit Port Stephens for the Nelson Bay group of Spinners and Weavers. (Lyn was asked to do a demo day on the looms). So off they set, with the looms in the back and had a wonderful day. It is so very rewarding to visit other groups of like minded people. Everyone has so much to learn and we were all the richer for it. The top section of this Gallery is the shop of all the different groups that meet there. The Spinners and Weavers are in the room at the bottom right. They put on a wonderful morning tea, lunch and made sure we were well fed and watered so to speak. They all jumped onto the looms to try and were very keen to see the way things were done. 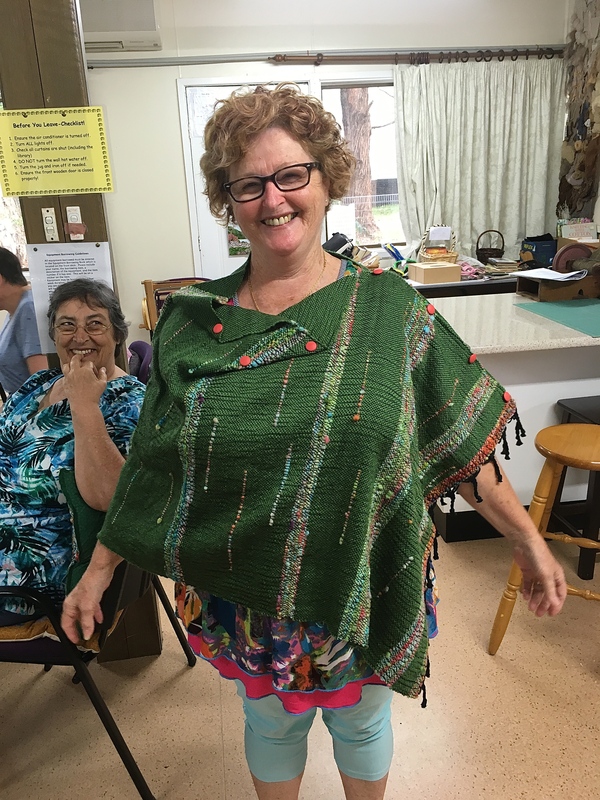 They had a couple of visitors from Tea Gardens and along with lots of laughs and a farewell to their President Merilyn, moving to the Mittagong area, everyone did enjoy the day. A couple of new comers popped in on the day and fell in love with the Saori. So after a few hours of fun and feeling so much better for our visit, Julie and Lyn packed up and returned home with all the more enthusiasm towards everything. Julie B and Lyn A. This is Faye’s first hand-dyed batt. What a brilliant green. 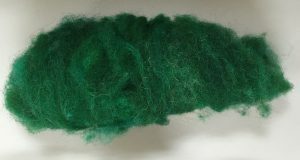 It turned out a little brighter than Faye expected (that’s what happens when you have dyeing expectations), so she is going to mix it with something to tone it down a little. Well done, Faye. 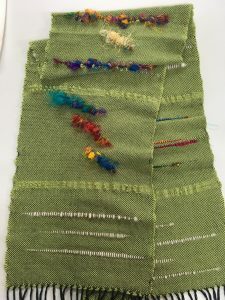 Here is Ruth’s latest Saori scarf with some sari silk and wool accents. Keep them coming, Ruth. 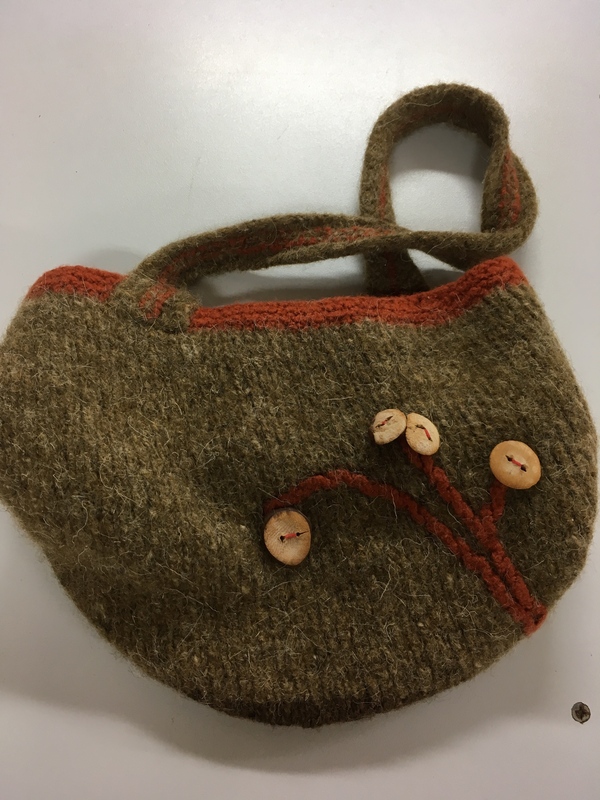 Gaye knitted and fulled this lovely shoulder bag. The buttons were made by Gaye from avocado seed. Gaye modelled this bag at the fashion parade at the Gathering in March. 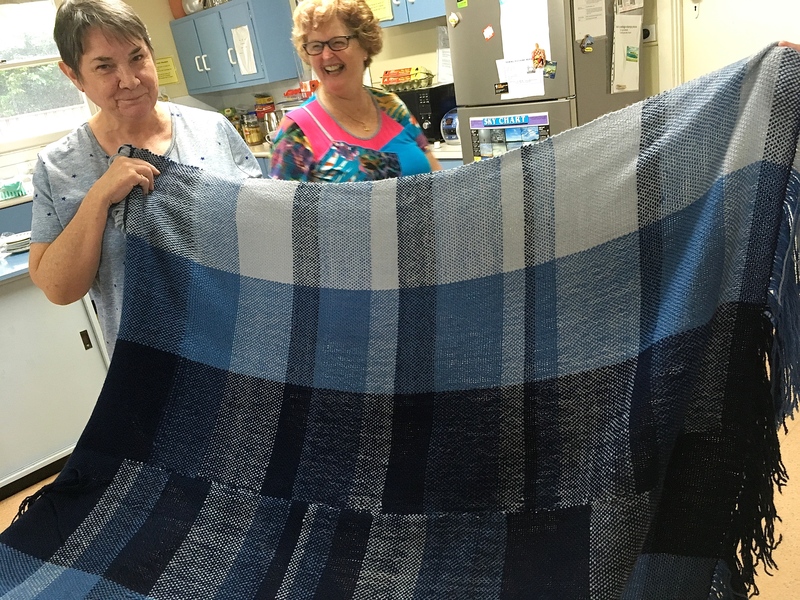 This is Sandra’s biggest weaving project yet. This beautiful blanket is so light and warm at the same time. Sandra’s weaving is just getting better and better. Faye has been so prolific with her spinning. 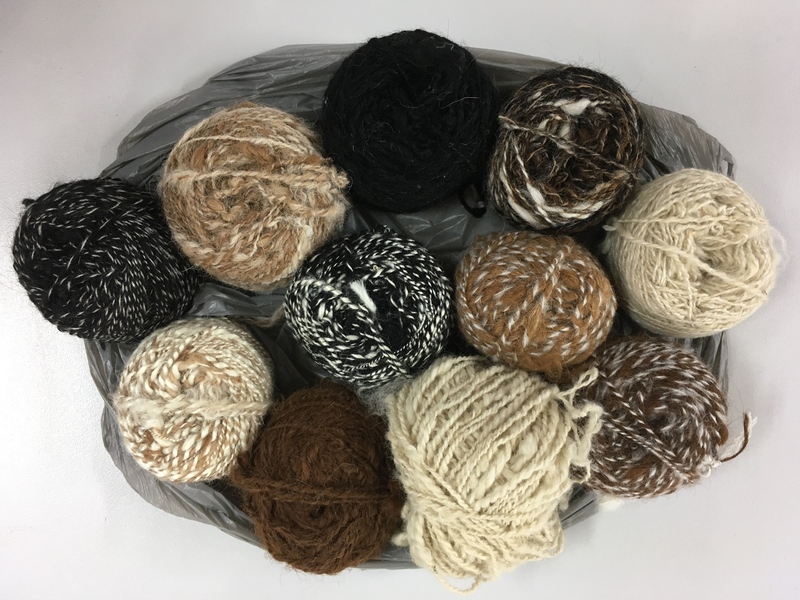 She loves spinning alpaca, and many of the above balls are alpaca singles plied with silk, with some wool in there as well. I think Faye has a big weaving project in mind. We all look forward to seeing the finished product. 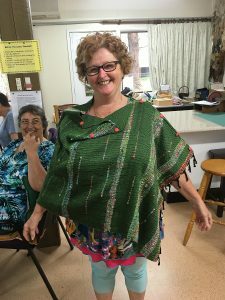 Lyn has created another beautiful garment with her saori loom. This poncho is lovely and bright, adding a highlight to any outfit, and warm to boot. I love the handspun accents. 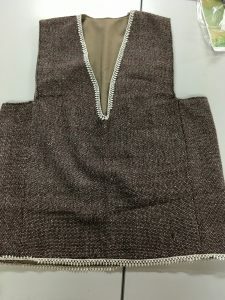 Gaye made this vest using woven lengths from her sample-it loom. She has nicely edged and lined this lovely vest. We started out on Monday 27th with our first workshop for beginners. This was very well attended by seven members: Linda, Lee, Faye, Sandra, Ruth M, Katie and Jane. Lindy was fabulous and showed how to warp and then lots of different techniques. Everyone was then able to go home and practice. Tuesday 28th was our Demo day and shop. Lindy demonstrated warping, the blending board, along with whatever any one wanted and a tahkli spindle. Nothing was a bother to Lindy and she answered everyone’s questions. We had a beautiful morning tea and a great day of being able to learn new things, purchasing goodies (this was not the shop of horrors) and having fun with like minded people. Thursday 30th, the advanced class was full on with ten members. Again we learnt many new techniques, things that a lot of our group had never seen done before. Sandra, Louise, Jenni M, Ruth M, Katie, Jenny C, Gay, Bev, Linda, Lyn all had lots of fun and laughs. Sandra, much to her own amazement was able to help Katie and Lyn when they ran into trouble. Go Sandra!!!!! Linda’s sample was done to perfection. Linda, you are amazing. These looms are so very versatile and you can do almost anything on them. We have ordered a new varident reed for the large rigid heddle loom to do thicker wool, fibres and rag weaving. All members were extremely happy with all the workshops and the Cottage was a buzz for the four days. Lots for everyone to look forward to in the future. Thanks to Lindy and Paul for all their help over the last week. They were faultless and we all enjoyed their company and each others, while learning at the same time. This was an experience to remember. Thanks to all those who participated and helped out during the time. Thank you. Lyn A.